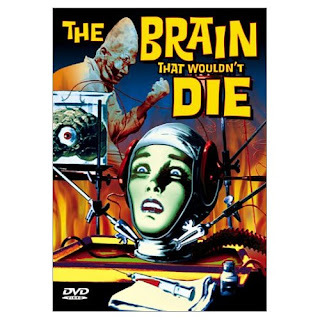 THE BRAIN THAT WOULDN'T DIE. A b-movie masterpiece from 1962. This movie is filmed in stark black and white and is simultaneously creepy and hilarious throughout. It is about a mad scientist who is also a neuro surgeon whose girlfriend is decapitated in a car wreck. He preserves her head and goes on a quest to find the perfect body parts to rebuild her. Where else does he go to but the sleazy strip clubs of New Orleans to find his victims? We get to soak in the atmosphere of 1960's New Orleans burlesque as our mad scientist searches for that perfect female...but he can't seem to find her. So he seduces the model, takes her back to his place, drugs her up, and gets her ready for surgery. But what about that thing in the closet? It has already killed his assistant... Revenge is sweet, isn't it? Watch as bloody havoc ensues and black and white blood sprays all over your TV screen! This movie is pretty gory for 1962. Recommend only for those whose tongues are firmly implanted in their cheeks. I dig this movie! Love this movie! Totally underrated! In fact, i'm wearing the shirt as I type this!